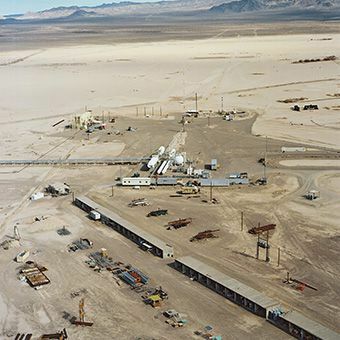 The Nonproliferation Test and Evaluation Complex (NPTEC), located on Frenchman Flat in Area 5 of NNSS, is a natural geological basin. It is the largest facility for open-air testing of hazardous materials and biological simulants in the world. The test area has elevated stacks and spill pans, as well as storage tanks for the test chemicals. test design and test execution support for customers to utilize during project execution. NPTEC also provides support to light aircraft and Unmanned Aerial Vehicles (UAVs) and is equipped with mobile command and control, release systems (gas/liquid), weather stations, and video ‒ ready for temporary deployment for approved Continental United States (CONUS) or Outside of the Continental United States (OCONUS) operations. All projects are conducted within environmental and safety regulations. The facility is available to private and public sector sponsors on a user-fee basis. 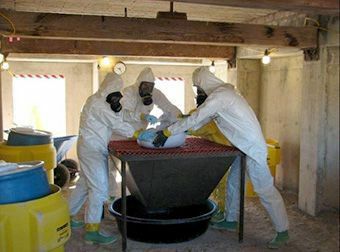 NPTEC is permitted and equipped to test a variety of multiple-release sources, including large-scale chemical releases, elevated stack chemical releases, and portable release systems. In addition, NPTEC provides sensor arrays for ground-truth data, an explosives pad, weather data instrumentation, calibrated release systems, and 24-hour release capability. Elevated stacks and spill pads are available to simulate realistic industrial release and accident scenarios. Test cell areas provide a method to expose materials and instrumentation to high concentrations of test materials in a confined space. NPTEC can operate anywhere on NNSS with restricted releases. Operations can be controlled remotely from the Command, Control, and Data Acquisition System Building, approximately one mile west of the test areas. An array of monitoring equipment, which includes anemometer stations, sensor stations, meteorological towers, and photographic stations, measures and records data on more than 1,500 data channels. Tower-mounted video cameras record the tests and a group of monitoring stations gathers a host of data, including wind speed, wind direction, and gas concentrations at various levels and distances.